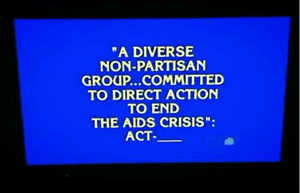 ACT UP Becomes A Question On "Jeopardy"! Home/Featured/ACT UP Becomes A Question On “Jeopardy”! ACT UP Becomes A Question On “Jeopardy”! ACT UP (AIDS Coalition to Unleash Power ) an international direct advocacy group committed to direct action to end the AIDS crisis lost its outlaw cred last night when it became a question on the long running game show Jeopardy. ACT UP was formed in March 1987 at the height of the AIDS Crisis at the Lesbian and Gay Community Services Center in New York. Larry Kramer was asked to speak as part of a rotating speaker series, and his well-attended speech focused on action to fight AIDS. Kramer spoke out against the Gay Men’s Health Crisis (GMHC), which he perceived as politically impotent. Kramer had co-founded the GMHC but had resigned from its board of directors in 1983. According to Douglas Crimp, Kramer posed a question to the audience: “Do we want to start a new organization devoted to political action?” The answer was “a resounding yes.” Approximately 300 people met two days later to form ACT UP. Hey, that’s my screen cap I posted on my Facebook page! !